Snapdragon 712 Faster CPU with Quick Charge 4+ Unveiled - Playfuldroid! In May 2018, Qualcomm had launched the 10nm Snapdragon 710 chipset. It had arrived as the first Snapdragon 700-series processor. The U.S.-based chip maker as introduced the Snapdragon 712 as the improved edition of the Snapdragon 710. The SD712 comes with a faster CPU and carries support for Quick Charge 4+. The rest of the specs of the SD712 is same as SD710 model. The Snapdragon 712 is a 10nm chipset that includes 8 Kyro 360 custom cores working at 2.3 GHz. The SD710 also features the same custom cores that clock at 2.2 GHz. The new chipset includes Adreno 616 graphics. It can support up to 20-megapixel dual camera and a single lens of 32-megapixel. The Snapdragon X15 LTE modem that offers download speeds of 800 Mbps and 150 Mbps of upload speeds. The SD710 is equipped with Quick Charge 4 whereas the new SoC supports Quick Charge 4+. Some other improvements on the Snapdragon 712 are enhanced Bluetooth audio since it features TrueWireless Stereo Plus and Broadcast Audio technologies. 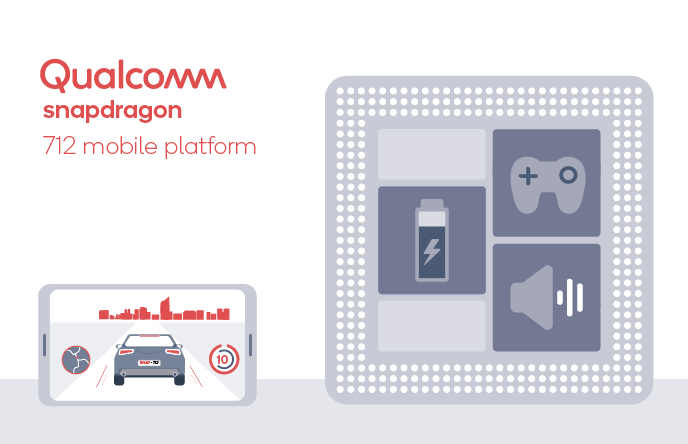 According to Qualcomm, the Snapdragon 712 is deigned to offer the right performance boost for gaming and beyond. It appears that Snapdragon 712 powered high-end phones may go official by the second or third quarter of this year.